So I wanted to take a good look at not only what I'm most excited about, but what I think you should be most excited about for the new year's MMOs. I've compiled this small list with a few important criteria in mind. First, these are only MMOs. Second, these are games that are pretty much confirmed to release in 2015 in a near-finished state, not just a perpetual open beta. What? This space trading sci-fi MMO is set in the 30th Century and will center around space combat. Who? Chris Roberts' Cloud Imperium Games is looking to follow the tradition of Wing Commander: Privateer, Starlancer, and Freelancer to provide one of the most anticipated games of the last 15 years. Why? Aside from the Chris Roberts name and the fact that the crowdfunding campaign continues to be the largest in video game history, Star Citizen is aiming to redefine player economy, space combat, and the entire genre convention. Released in several components, Star Citizen will have an MMO part and a single-player part with drop-in multiplayer co-op. If that's not enough, imagine space flight with an Oculus Rift. When? While some of the initial modules have already been released in various stages, Squadron 42 (the single-player campaign) is set to release in 2015 and the MMO module in 2016. No, that totally counts. What? A modern-day, apocalyptic third-person shooter that has you playing as part of an elite militaristic group that is out to fight the threat that erupts after a disease wipes out a large portion of the country. Why? The only modern-day MMO of the bunch, The Division is the large-scale multiplayer game that Tom Clancy fans have been waiting for. When? While originally slated for 2014, a recent delay has pushed it to 2015. What? A post-apocalyptic sandbox MMO that takes place on the planet Rhyldan. As colonization failed on the new planet, the remaining humans splintered into factions left fighting over remaining resources. Why? The game is extensive, deep, and highly ambitious with what it's setting out to accomplish. But some of the top features include a three-faction PvP system, player-built cities with elected mayors and military, player-created missions, no player levels, skill-based progression, non-combat roles, pets, vehicles, advanced crafting, and much more. When? Currently in Alpha Round 3, the release is expected sometime in mid-late 2015, according to the website. Why? Already an established franchise with decades of support and experience, a WAR40K MMO should be the perfect culmination of all of that. The developers have already said how pleased established fans will be with how true the MMO stays to the WAR40K universe. What? A military MMO where you command a variety of World War II-style naval vessels to band together with other players and eliminate the enemy in various battlefield scenarios. Who? Wargaming, makers of the insanely popular World of Tanks and World of Warplanes. Why? The gameplay model of World of Tanks and World of Warplanes is a proven success, and World of Warships will cap off the trilogy that was first announced back in 2011. When? Beta starts early 2015 with a proposed release later in the year. What? Sandbox MMO set in a high fantasy world playing out the conflict between two main rivals: the Republic of Calpheon and the Kingdom of Valencia. Who? Korean game studio Pearl Abyss has been working on the game since 2010. Why? Not only does the game feature a large seamless world, but it also features an Assassin's Creed-like parkour movement system; action combat based on aiming, dodging, and combos; a full weather system with typhoons, fog, and other elements to affect gameplay; and full mounted combat with animals you raise and breed yourself. When? 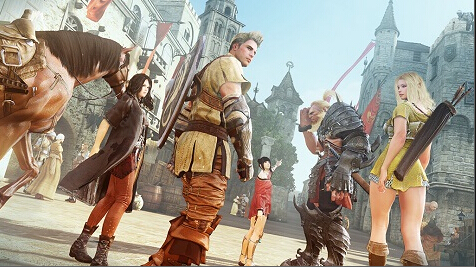 On December 5, the developer confirmed that Black Desert would be coming to the Western market sometime in 2015. What? The latest game in the EverQuest series, EQ Next is said to be set in a parallel world to Norrath. It will not only be available for the PC, but also the PlayStation 4 and the Oculus Rift, hinting at some interesting possibilities with virtual reality. Who? Sony Online Entertainment has been working on the game presumably since 2009 or earlier. Why? If you're an EverQuest fan, this one is a must, but the game aims to have a further reach than just dedicated fans. SOE also released a companion sandbox game (EverQuest Landmark) which is said to introduce potential players to how EQ Next will work as "the largest sandbox style MMO ever designed," according to SOE president John Smedley. When? No concrete release date yet, but with Landmark established, I imagine Next can't be too far behind. I'd bet on summer of 2015. What? A Zombie MMO made in the same engine as PlanetSide 2 and EverQuest Next. It's set in the rural U.S. and the key is to survive the zombies, the elements, and other players. Who? Sony Online Entertainment is working on this one, too. Why? The big thing here is the fact that the game is capitalizing on the wild success of games like DayZ and Rust, but with the support and resources of Sony. It's not meant to be a PvP game that just so happens to have zombies (like DayZ), but centered more on surviving the zombie apocalypse. When? Steam Early Access starts on January 15, 2015. What? An ambitious sandbox MMO set in a realistic medieval land where you build and craft to your heart's content while always watching your back. Who? Indie studio Bitbox Ltd.
Why? Full loot, free-for-all PvP, terraforming, complex crafting, large-scale castle sieges, no-target combat... think of it as Wurm Online meets Mount & Blade. When? According to the website, it's expected to release in Fall/Winter 2015. It's currently available in Steam Early Access as an alpha. What? A fantasy game that teases "so much more," including mythology and technology. The idea is that your character steps through gateways that will allows play in several different settings. Who? Citadel Studios is made up of a team of veterans, including Ultima Online's Derek Brinkmann, Bruce Bonnick, Tim Cotten, and Mike Moore. Why? Forget levels, classes, and rules. Shards Online aims to take what you know about MMO worlds and turn them upside down. The game's FAQ says it best: "Imagine learning to craft ancient alien technology in our terminus shard and bringing those items with you to the fantasy world!" When? No official word, but the rumors say 2015.